I'm a big Costco fan and go there quite often! Here's what I typically buy and why I love the store. I'll break this post down into two parts since I have so much to cover! This week, I'm focusing on groceries. Silk Original Almond milk. At $2.79 a carton, this is a pretty good deal. It comes in a three pack. Coffee beans. 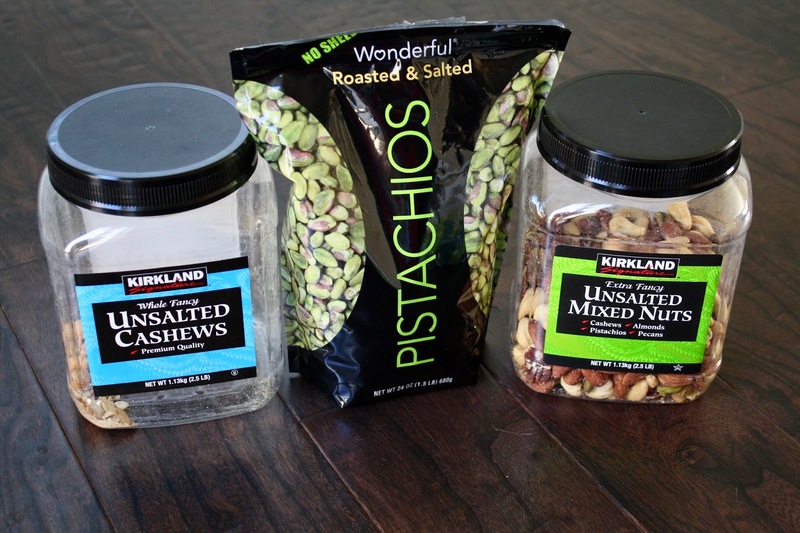 I love their Kirkland brand and at $9.99 a bag, it's a great deal. I also like the Cameron Organic Velvet Moon blend, which you can get for a similar price. Dave's Killer bread. After hearing about this brand on other blogs, we finally tried it! I am happy to have found a bread that both Craig and I like. It toasts well, is great for sandwiches, and the ingredients are healthy. Fresh raspberries. I switch between buying organic (even though I know they're in the dirty dozen category) and conventional, depending on the price. Costco's organic produce is usually fairly priced. Frozen berries. Their prices on frozen organic berries/fruit are unbeatable. This big bag of organic raspberries cost me $12.99. Sadly, they are not carrying this again. Red grapefruit cups. I love grapefruit, but dislike peeling the actual fruit and the rind that comes with it. I always feel like I never get enough of the actual fruit pieces to eat. That is why I keep purchasing these red grapefruit cups to take in my lunch. I simply empty out the syrup and eat it. 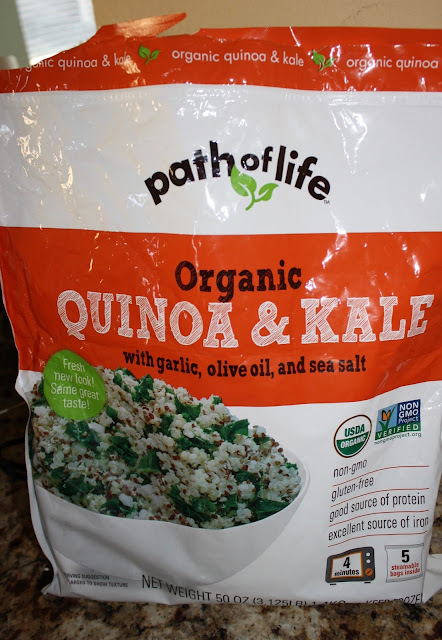 Quinoa and kale. I found this in the frozen section and it's a great base for a work lunch. I usually just add chickpeas and spices to it. Morning rounds. I used to buy these more often when they were the Cranberry Orange flavor pictured below. They switched to Muesli flavor and it's just too boring for me. My mom still loves them. They were a nice quick breakfast to toast up or warm up in the microwave. I also liked putting almond butter on top for a little protein. Pizza. 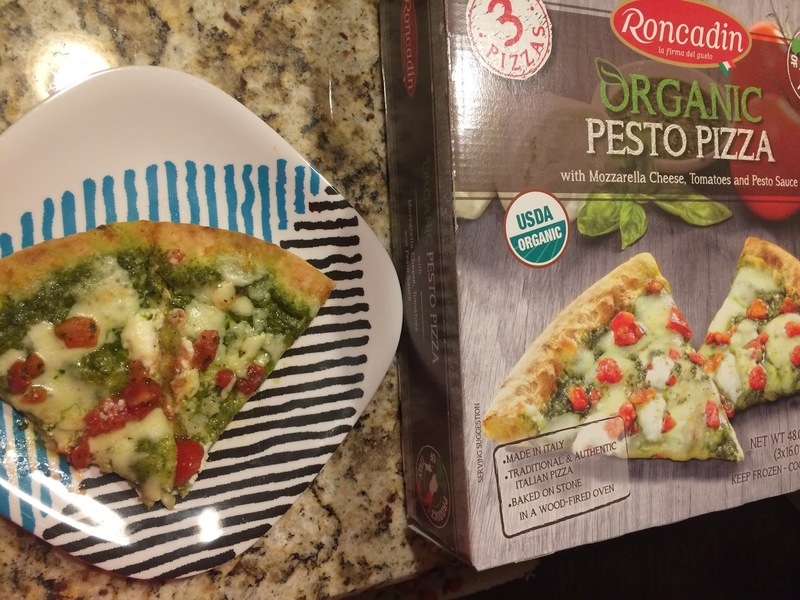 Most of their vegetarian frozen pizzas are a fair price per pizza. This flavor was delicious, but sadly the lady handing out samples of this last time I was there said they were no longer going to carry it. Juice. Craig's the juice drinker in this house. That's not to say that I don't pour myself a glass from time to time, but I know it is better to eat fruit than drink it. 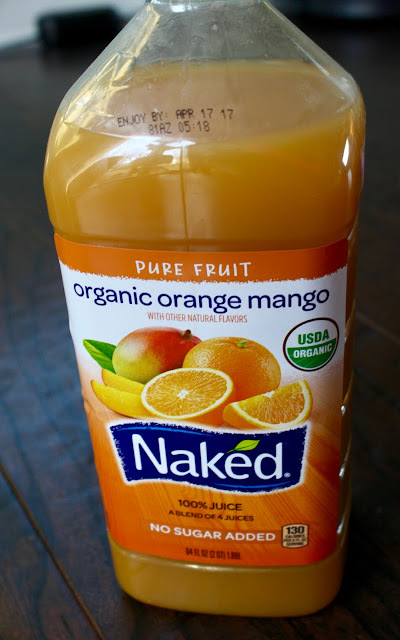 I do love adding a little of this juice to a smoothie, which makes it instantly delicious! Coscto seems to switch up the juice flavors they have pretty regularly. I was buying a Naked green juice for Craig for a while and then that disappeared from the store. Nuts. Craig says I have a nut problem, ha ha! But, he's kind of right. Since I am a vegetarian, I tend to eat handfuls of nuts at home or at my work desk to get a little protein and fat. Their prices are fantastic, especially for the pistachios. I usually get that big bag for around $15. Now onto some misses. I probably should have taken advantage of Costco's fabulous return policy and just brought back any items I didn't like, but I always feel weird about doing that when I've tried some of the product. Kirkland Organic Hummus. These are the perfect snack size containers, so I thought they would be great for lunches. I usually am not that picky about hummus, but this one is too garlicky for me and the flavor is just blah. I also don't like how much plastic is wasted with these little containers, so I guess I'll just stick to making it myself or buying bigger containers from now on. Vegetarian frozen meals. While I love most of the vegetarian frozen meals I find at my store, we have felt that recent selection has been disappointing us. We used to buy frozen Indian samosas that came with an amazing cilantro chutney. Now those come with meat samosas, so I can't buy the product anymore. It is always nice to have a few frozen meals in bulk for Craig and I to take to work when we have prepared a meal. I'll keep hoping my store improves in this area. Furniture. While I think they have wonderful prices on furniture, the selection isn't always that appealing. They tend to carry very dark wood tables, dressers, etc. in their stores. I'm a big fan of white furniture, so maybe it's simply my opinion. Online is a different story though--they do have a wider selection there. I am not sure some of their prices are that discounted on furniture items. Inconsistency. As I mentioned above, the inconsistency with products is a little disappointing. I think this is normal for any store, but just when I start to love a product, it seems like Costco no longer stocks it. Overall, I have to say that I have been extremely happy with the customer service and cleanliness of the stores in our area. Their cashiers are always friendly and quick. I never feel like I have to battle with anyone at the return desk (well there was one incident with a price match). Are you a Costco member? Please list some of your favorite items below if you are! I love peeking into other people's carts and seeing what they like to buy, so this is sort of a virtual way to do that! Last summer, I was constantly buying the giant tubs of potato salad. I think it saved my live 4th of July weekend when the kids and my mom were all up in Door County (I should have bought two that weekend). And their organic sugar is the best price around.